The Diamond Jubilee bank holiday has promted a flurry of celebratory beer festivals and special ales, so whether you'd like to toast The Queen or drown your republican sorrows you'll have ample opportunity. The Alma, Newington Green. The pub's Welsh cider festival presents 20 different ciders and perries alongside matched foods. Entry is free and all pints are £3.60. Red Lion, Isleworth. Live music on Saturday, Sunday and Monday is accompanied by a celebratory range of over 50 ales, ciders and perries. The Old Red Cow, Smithfield. 15 British beers and a selection of snacks will be on offer at this ever well-stocked pub. The Herne, Dulwich. Their Jubilee beer festival has a packed programme of events, including a performance from the Dulwich Ukulele club and a Royal pub quiz. The White Horse, Parson’s Green. Beers from Weltons, Westerham, Adnams and Windsor & Eton breweries will be on offer for their Jubilee celebration, alongside their usual vast range of beers. Family activities will also be taking place and their BBQ will be operational. Black Dog, Vauxhall. Local ales, traditional food and a hog roast are all on offer in celebration of the Jubilee. You’ll be able to watch the Thames Jubilee Pageant on the pub’s big screen, as well as participate in their cricket match if the weather holds up! Junction Tavern, Kentish Town. 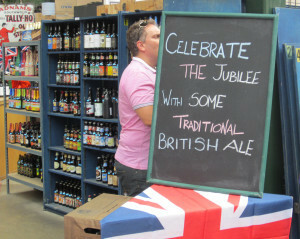 More than 30 real ales from independent breweries will be on offer, many of which have been brewed for the Jubilee. Pints are £3.60 or £3.40 for CAMRA members. Book Club Jubilee Street Party, Leonard Street. As part of the street party, the London Fields brewery will be running a real ale festival, which will include their special Jubilee brew. The Rake, Borough Market. The tiny pub's Northwest beer festival presents the best beers from Manchester, Merseyside, Cheshire, Lancashire and Cumbria. Beckenham Rugby Club, Beckenham. 70 beers, ciders and perries are available, alongside live music on Friday night and all day Saturday. Admission is £4 (£2 CAMRA) for Thursday night and all day Friday, or £1 all day on Saturday. Euro 2012 will be shown on big screens, but the marquee will be football-free. JJ Moons, Ruislip Manor. Up to 30 ales out of the festival’s 70 will be on offer at any one time. All beers will be from breweries within a 30 mile radius of London that have been established in the last 10 years. Westow House, Crystal Palace. Celebrating the Crystal Palace Overground Festival, the pub will be offering a range of brews from English micro-breweries. Check the website for the full list. Duke of Hamilton, Hampstead. 30 ales from the Cotswolds will be available during this new annual beer festival, which also offers traditional West Country snacks, live music and entertainment. On Sunday, the event will coincide with the Hampstead Summer Festival.